Zucchini brownies are a healthier recipe for brownies, and these are the BEST zucchini brownies ever! They’re ooey, gooey, and SUPER fudgy brownies. And NO one will know they have zucchini inside! Think of how I feel? At one point I think I had seven ginormous ones in my crisper drawer. Unfortunately, two didn’t make it through. When you get a pile of veggies that just keeps growing…things get forgotten underneath. Alas, only one is left. I haven’t had to buy zucchini for dinner in over a month. In another few weeks, I’ll be grumbling at the prices and wishing I wasn’t having to buy it to make these zucchini brownies again. 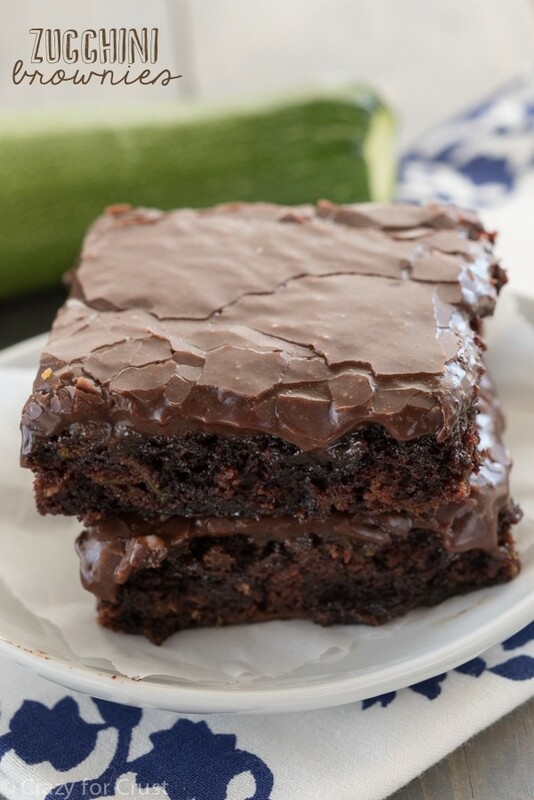 Because, my friends, I will be making these zucchini brownies again. 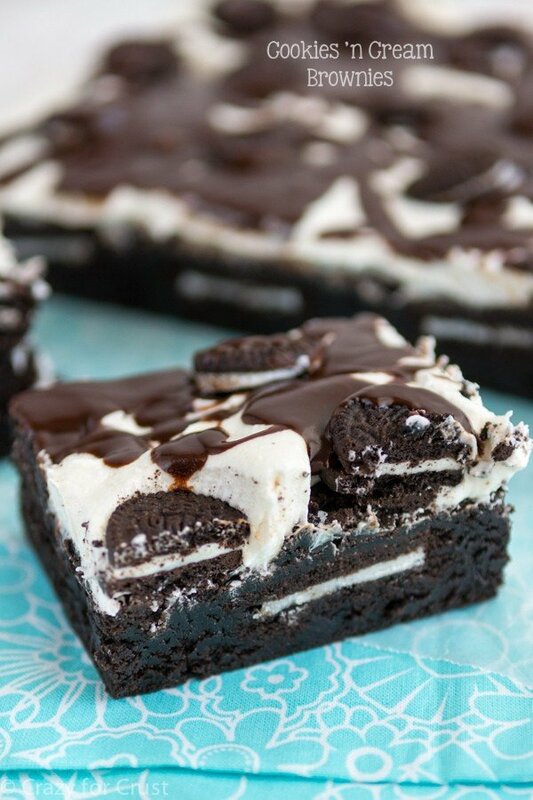 They are delightfully fudgy, due in part to the chocolate frosting on top. These brownies are addicting and so good. 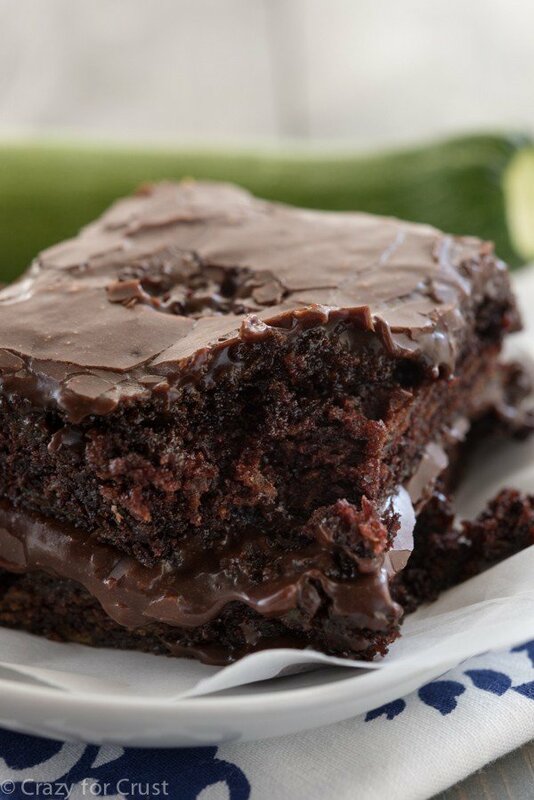 They’re gooey, fudgy, and super chocolaty…and they have zucchini in them. So they’re healthy brownies. Practically a vegetable. 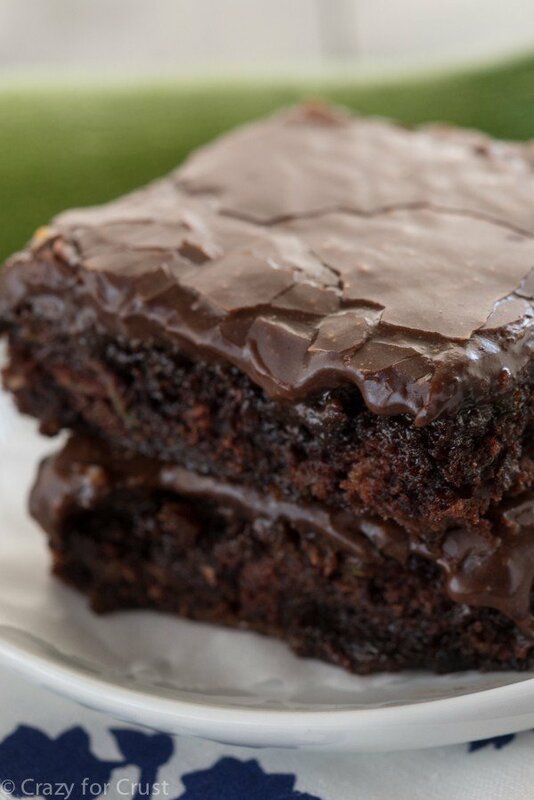 I promise you though – NO ONE will guess there is zucchini in this homemade brownies recipe. They taste like the most decadent brownies ever…and it just so happens they’re a vegetable. When you make the recipe you’re going to think something is strange, because there are no eggs in it. Yes, that’s right, a brownie without eggs. 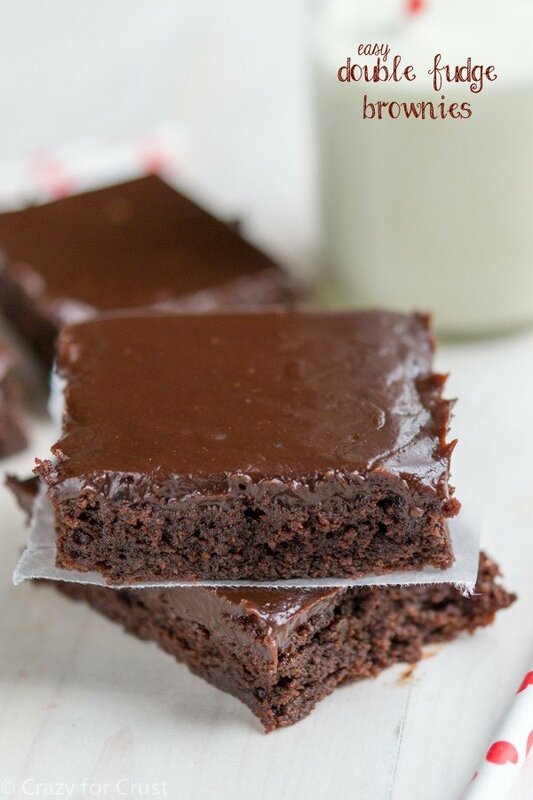 Also, there’s no butter in the brownies, so if you skip the frosting these are vegan brownies. The recipe calls for water as an additional binder to the zucchini. How much water you add will vary depending on your zucchini. If you have a very wet zucchini, you may not need as much water. Add a tablespoon at a time and stop adding once the mixture JUST comes together and is no longer powdery. It is a very thick dough, almost like cookie dough. This batter is not a traditional brownie batter consistency. Let’s talk about frosting. My Grandma (my mom’s mom) used to make the best vanilla frosting. It was smooth and soft and got kind of crunchy after sitting on the cake. Problem was, my Grandma never measured. So no one was really sure how she made her wonderful frosting. Then I made these brownies and I think I’ve figured out her secret: melted butter. I can’t wait to experiment more to see if I can make the frosting from my memories. Now you pretty much know the secret to the ooey gooey chocolate frosting. It’s cocoa, melted butter, milk, salt, and vanilla. No mixer even needed, just use a whisk! Pour it over the cooled brownies and let it semi-set. This frosting stays gooey and wet with a teeny hardening on the top. I could drink the stuff. I hope you enjoy these as much as I do! I apologize in advance if you end up spending to much at the grocery store because you’ve run out of zucchini in your garden. They are that good. Preheat oven to 350°F. Line a 9x13" baking pan with foil and spray with cooking spray. Set aside. Using an electric mixer fitted with a paddle attachment, mix together the oil, sugar, and vanilla until well combined. Add the dry ingredients and stir. Fold in the zucchini. Let the mixture sit for a few minutes so the batter can absorb the moisture from the zucchini. Then, if your mixture is still very powdery, add up to 5 tablespoons water (start with 1 tablespoon and work up from there, stirring well after each addition). The batter will be very thick but shouldn't be powdery. (It partially depends on how wet your zucchini is!) Add walnuts, if desired. You may need to use your hands to work the water in instead of a spoon. The dough is super thick, like cookie dough. Do not add too much water! Spread in prepared pan. Bake 25-30 minutes until the brownies spring back when gently touched. To make the frosting: Whisk butter, cocoa, salt, and powdered sugar. Whisk in milk and vanilla. Spread over cooled brownies. Cut into squares and chill to semi-set. The frosting hardens slightly on the top but stays wet and gooey underneath. These brownies are best stored in an airtight container and eaten within 2 days. Chill them to make them last an extra day. They're what I call "fork" brownies because they are so gooey. *NOTE* People have been saying these brownies are cakey. Every time I've made them they turn out super fudgy like in the photos. The problem is how much water you add. It's hard to say how much to add because every time I've made these I've added a different amount. It really does depend on your zucchini. The batter will be very thick and need help spreading in the pan. If your batter is at all liquidy or thin you're going to get a more cakey brownie. Want more delicious brownie recipes? Come on, you know you do. Mint Chocolate Brownies, from Wine & Glue. Peanut Butter Brownies with Chocolate Ganache Frosting, from It’s Yummi. 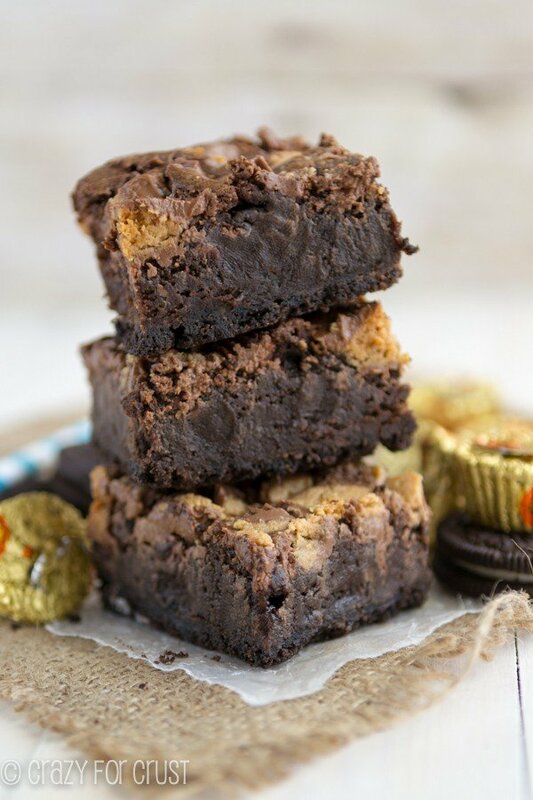 Buckeye Brownies, from Brown Eyed Baker. Definitely avoids the cake-y texture with the extra moisture and honestly makes them more dark chocolate tasting. Great recipe!!! Icing was great! Hands down THE BEST BROWNIES I’VE EVER EATEN. Can you subtitute olive oil or coconut oil for the vegetable oil in the zucchini brownie recipe? I have made these ~4 or so times now. For different crowds. They are PERFECT. Always rave reviews, always surprise they have vegies in them, always requests for the recipe. I have never had to add water but sometimes just wait a bit until the liquid starts to come out of the grated zucchini. The icing is also yum. I do prefer my version that excludes milk though. Thank you! Such a crowd (and me) pleaser. Do you peel the zucchini before grating it?